Easily opens gaps through reinforcements and previously demolished structures. 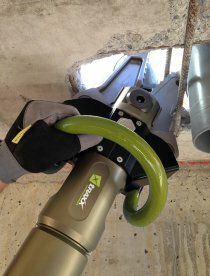 The CS350 TEHMA portable handheld hydraulic combi shear spreader cutter allows to cut and separate profiled metal structures securely, without dangerous splinters or sparks. The teeth on the tips ensures a firm grip on every type of object and structure that is intended to be separated or spread while the special internal geometry allows the cutting of reinforcements and iron rods at different heights for the best use of the blade. Removal of radiators and frames for doors and windows from walls. Cutting of metal profiles and structures reinforcements (steel meshes, iron rods and rebars). Cutting metal sheets and scraps. Quick separation of blocks of reinforced concrete structures previously demolished. (by means of TEHMA CC300 concrete crusher or TEHMA SP400 hydraulic concrete and rock splitter). Recycling of precious car parts such catalytic converters and mufflers. Interventions in the presence of water and underwater demolitions. Rescue interventions for the extrication of victims after accidents. Use of pulling chains to increase the action radius of the tool. Cut steel bars and reinforcing iron rods without dangerous splinters or sparks. 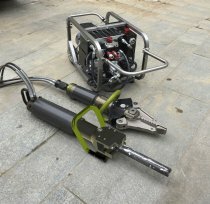 Cut pipes and electric or steel cables without dangerous twisting of the blades. Enlarging openings and separates materials, objects or blocks in previously demolished reinforced concrete structures. Various applications for Industrial, recycling, nuclear decommissioning and car demolition. 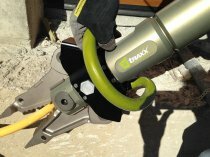 Solid and handy, TEHMA Handheld hydraulic combi shear spreader cutters can easily stand the heavy duty uses of the demolition and represent an optimal completion of the SP400 TEHMA hydraulic concrete and rock splitter. 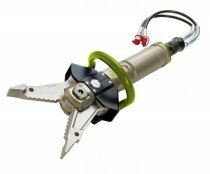 Their versatility and performance also make them indispensable allies for industrial, recycling, car demolition and rescue.